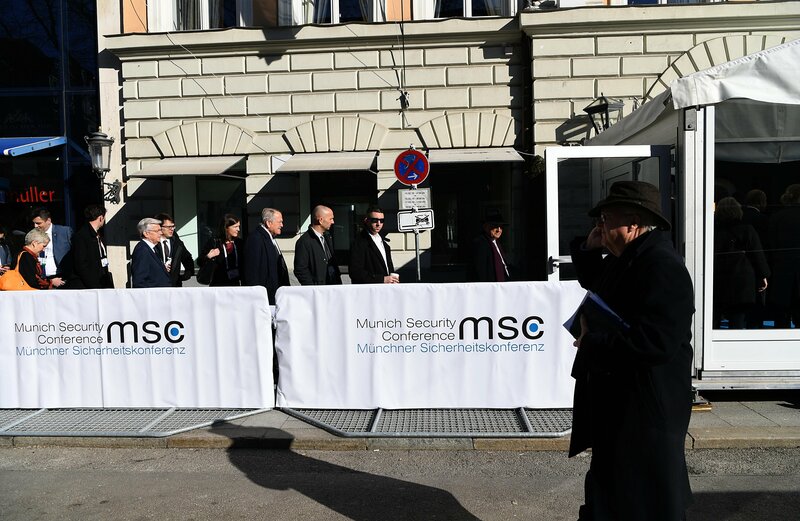 The annual Munich Security Conference last week brought together more than 100 world leaders and ministers. In the serene and somber setting of Munich's luxury hotel Bayerischer Hof, they discussed the multiple security issues facing the world. Before the start of the conference, the organizers launched a report entitled "The Great Puzzle: Who will pick up the pieces?" in which the unknown writer(s) in the introduction described the world as being at the cusp of a new age of big power competition involving the U.S., China and Russia, as the existing order was crumbling. The document set the tone of the three-day event. As the conference progressed, the strain on transatlantic ties became increasingly evident. The tension between historic allies is seen as proof the old world is falling apart. The context of the rift was provided by German Chancellor Angela Merkel, dominating the stage in the absence of leaders of other major powers. Merkel criticized the U.S. leadership for its policies on issues ranging from Iran's nuclear program to the treatment of German car-makers. Her tenor was in sharp contrast to U.S. Vice President Mike Pence's speech in which he tried to be more diplomatic. A clear difference was noted between the muted enthusiasm of the audience towards what Pence said, especially when he mentioned Donald Trump, and a standing ovation and huge applause for Merkel at the end of her address. The German leader minced no words in showing her disapproval of Trump's approach to the challenges of the world. She rejected U.S. handling of the Iran nuclear agreement issue and its withdrawal from that process. She also criticized Trump for announcing a "hasty" pullback of troops from Syria. There are also question marks over whether ISIS is really on the brink of final destruction as Trump claims. Many people believe that the threat posed by the militant organization has certainly decreased, but it is not yet over. The loss of the regional caliphate proclaimed by the group does not mean its potential for waging terror has ended. Europe is also weary of U.S. criticism of its commercial relations with Russia, especially the joint German-Russian Nord Stream 2 pipeline project. The Trump administration fears it will increase Europe's reliance on gas imports from Russia. The Munich conference shows that the tension between U.S. and EU is intensifying. The rift is becoming more complex due to lack of any direction in domestic U.S. politics, mired in an unending war between the Trump camp and those who oppose him. The issue between EU and U.S. is not just about who should pay how much for collective security mechanisms like NATO, but also relates to the two sides obviously not being on the same page about the contours of the new global order. The old order based on post-WW2 arrangements was successful in managing chaos for decades but that period of predictability is over. The new multilateral system is still taking shape and the role of various global actors is unclear. Initially the Europeans thought the real problem was Putin and his actions in Crimea and Ukraine; now, their immediate concern is Trump's questionable trade and security policies, due to which traditional allies like Germany, France and Canada find themselves in a quandary. Trump's leaning towards nations with leaders possessing questionable democratic credentials is considered in many European capitals as a catalyst to expedite the demise of older institutions and traditions. The democratic liberal ethos is still well entrenched in many countries of Western Europe despite the rise of politics of ultra-national tendencies. It creates tension with Trump who puts American monetary interests on top of every other consideration. Europe is trying to assert itself in the changing scenario, rather than bowing to what is coming out of Washington. The independent policies will further upset transatlantic relations. This new phenomenon of "west-west tension" will increase global political uncertainty as well as provide fuel for many conflicts around the globe. Let us be ready for tenuous situations and security escalations during 2019 and coming years.